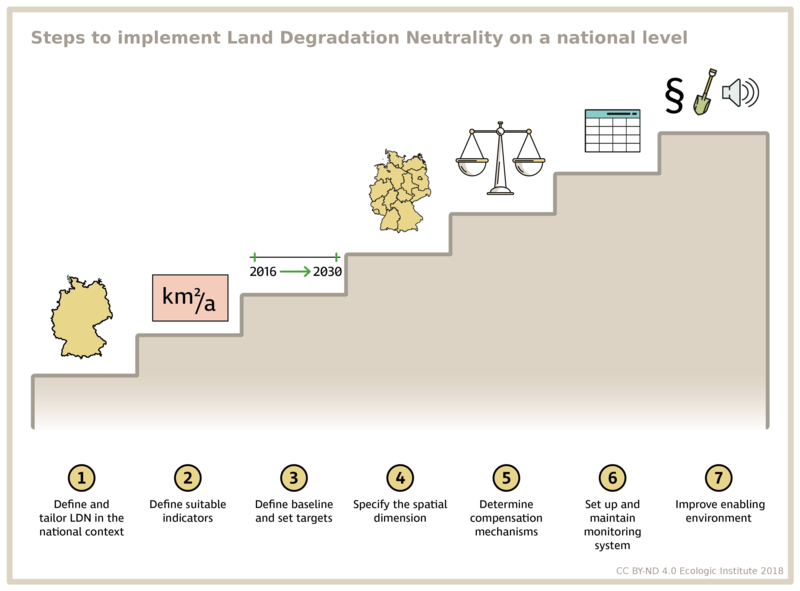 This report presents the key concepts, definitions, and implementation approaches for SDG 15.3 on “Land Degradation Neutrality” (LDN). It discusses options for implementing LDN in Germany and suggests a proxy indicator based on land use changes. The 2015 agreed UN Sustainable Development Goals present a set of ambitious targets for development until 2030. One of the goals that is of high relevance for soil protection is subtarget 15.3 on "Land Degradation Neutrality" (LDN). However, the concept behind LDN yet needs to be further specified to the national context and indicators need to be agreed on. As part of the implementation process in Germany, the Ecologic Institute carried out and finalized in January 2018 a research project on behalf of the German Environment Agency. It provides a suggestion of necessary steps and guiding questions towards the implementation of LDN at the national level. Most importantly, it introduces an approach for a new indicator which uses land use categories as a possible proxy indicator. Each category is assigned with a certain soil value that considers the exposure to soil threats, building on and further extending the hemeroby (naturalness) concept. Another aspect of the project was to contribute to the EU process of initiating LDN implementation. For this reason, a separate English report has been published ("Implementing SDG target 15.3 on "Land Degradation Neutrality": Development of an indicator based on land use changes and soil values"). This second report provides an overview about land degradation in Europe and existing monitoring schemes and policy processes that are relevant for the implementation of LDN. A series of infographics helps explain concepts related to LDN and soil and is available below. Wunder, Stephanie, Timo Kaphengst, Ana Frelih-Larsen, Keighley McFarland, Stefanie Albrecht (2018): Land Degradation Neutrality – Handlungsempfehlungen zur Implementierung des SDG-Ziels 15.3 und Entwicklung eines bodenbezogenen Indikators. Report number UBA-FB 00. 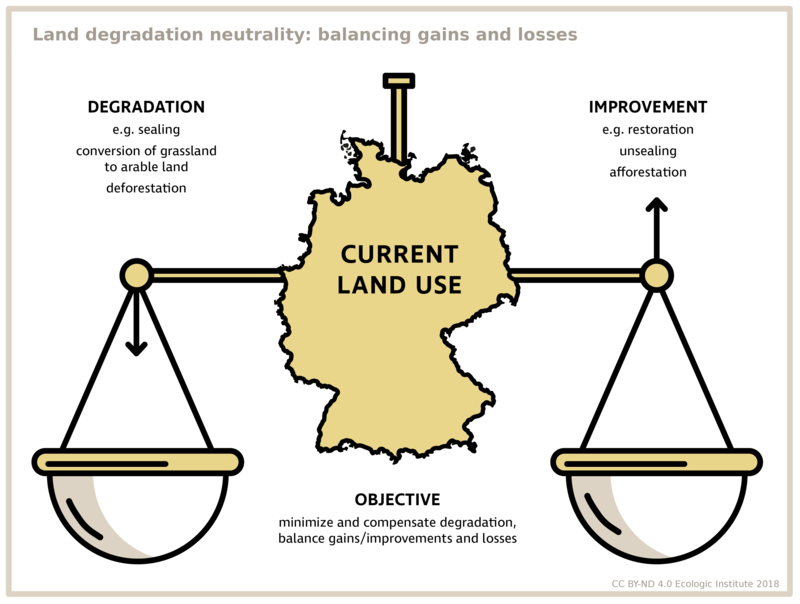 3 Begriffsklärung "Land Degradation" und "Land Degradation Neutrality"
3.2 Was ist "Land Degradation"? 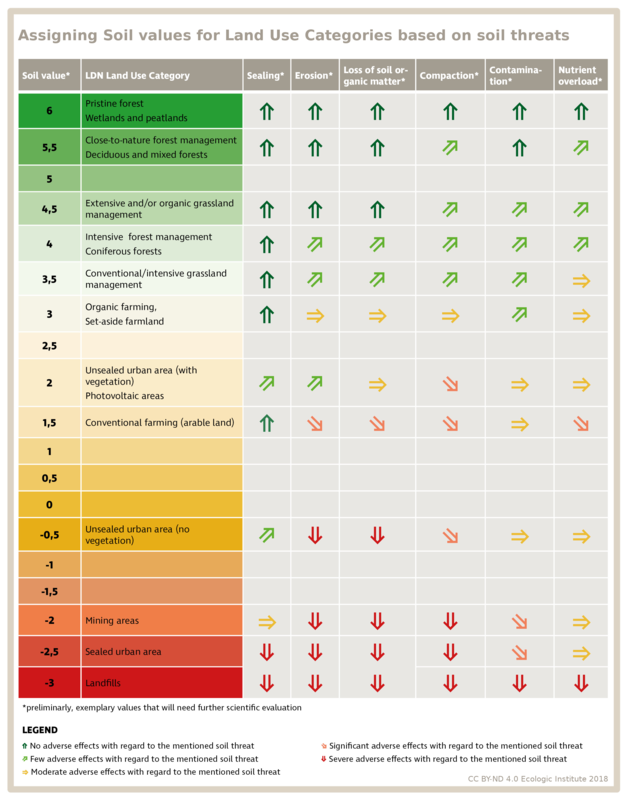 3.3 Was ist "Land Degradation Neutrality"?